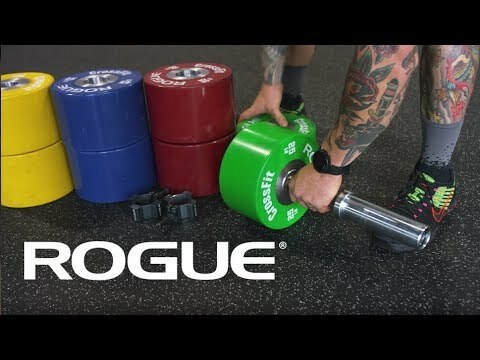 Designed specifically for use with our Loadable Dumbbells, Rogue’s cylindrical Dumbbell Bumpers come in six weight increments (10LB, 15LB, 25LB, 35LB, 45LB, 55LB)—each measuring the same 230MM in diameter. This unique patent-pending design allows athletes to load on more weight, customized to their training level, while still maintaining the compact look and feel of a traditional dumbbell. While Rogue’s DB-10 and DB-15 Loadable Dumbbells are compatible with other Olympic plate options, our specialized Dumbbell Bumpers offer a new opportunity for a more centralized weight distribution and easier handling. Each Dumbbell Plate is also built to the same quality as our full-size Rogue Color Training Plates, with a tested Shore A durometer of 88, along with a chrome-plated insert and bright color finish. The weight tolerance is +/- 1%, and all plates include exclusive Rogue branding. There is no better way to get the most out of your Rogue Loadable Dumbbell than with the addition of these plates. The cylinder shape of the Rogue Dumbbell Bumper means that each weight increment, from 10LB up to 55LB, has the same 230MM diameter (roughly 9"), creating a much more compact and natural-feeling dumbbell. The three largest plates (35LB, 45LB, and 55LB) are a universal 150MM in thickness, as well. The center inserts are cut-out to fit over the Loadable Dumbbell collar for a secure fit. Rogue Dumbbell Bumpers are essentially condensed versions of our standard full-size Rogue Color Training Plates. The quality rubber construction and 88 durometer—paired with a solid chrome-plated insert—ensure long-term durability. Color finishes are used in the same pattern as our traditional plates (Black / Green / Yellow / Blue / Red) for easy on-sight recognition, and the exclusive branding includes the Rogue logo above and below the collar opening. Rogue Dumbbell Bumpers is rated 4.6 out of 5 by 11. Rated 5 out of 5 by Jab106 from Good Compact Bumper for Barbell I bought several 10s and a 15 to use with a barbell for the basement gym. Fullsize plates would hit the ceiling in overhead lifts at my height, but these do not. They are pricey, but I like having the rubberized plates for protection as well as reduced noise. (not approved for overhead drops by Rogue tho). Not sure there is any benefit to the bigger plates--equivalent stacks of the 10's and 15's provide far more adjustability for equivalent bar space. I don't think any of the bigger plates are worth it at this point. Rated 5 out of 5 by Wingsdomain from Not just for dumbbells, smart users use them too! These dumbbell bumpers look and feel great, but they're not just for dumbbells, smart users will use them for curling bars and other barbells too! Their small diameter are perfect for low ceiling garages and other tight spaces when you want to use bumpers but can't afford the space the standard 18" diameter bumpers take up. Rated 5 out of 5 by Who U Wit Fitness from Love the size of the dumbbell bumpers Dumbbell bumpers are the perfect size and I love that they are round. Great for bodyweight flyes. Also works with your barbell. Rated 4 out of 5 by Dbone from Ohio cerakote power bar, and bumper plates I got the Ohio power bar with cerakote, red shaft with black sleeves, solid quality bar, 29mm shaft is nice and solid for a man's bigger hands, feels different then the barbells at my gym. I'm very satisfied with the purchase. I also got a couple of dumbell bumpers, good quality. Shipping was good, barbell was packaged very well. It seems like Rogue is one of the better companies to deal with. Very satisfied. Rated 4 out of 5 by Sean E from Good product for right use with some planning 10/15s offer good value and equivalent performance for oly/off-the-ground DB work compared to change plates/rubber coated plates. Assuming you pair these with the loadable DB, they are as good or better than standard DBs for oly/off-the-ground lifts. However, shoulder rack positioning and chest pressing require some adjustment due to DB length. Getting to lift position and dumping DBs during bench work is also really awkward, as ends dig into legs and you shouldn't dump onto end cap. If you get 2-10# and 3-15# pairs ($325) with DB-15 loadable dumbbell, you can build a 35#-105# DB at 10# intervals with even diameter/weight distribution. Add 1.25#, 2.5#, and 5# change plates and you have a 15#-115# at 2.5# increment DB set for ~$1,300, which is a huge value and space friendly versus standard DB set. To this point, 10/15 bumpers with loadable DB offer great performance/value with right planning. I can't speak to how 25#, 35# and 45# DB bumper performance compared to stacking 10s/15s, but they seem redundant to me if you are on any sort of budget. If you really need that 125# DB the 55#s get you, a set of rubber coated hexes might be the way to go. Rated 5 out of 5 by MrJ24 from Top quality Another top quality item from roguefitness. Soft exterior, nice heavy feel. Happy with my purchase. Rated 5 out of 5 by JessicaChop from Awesome quality and perfect sizing I ordered two 10lbs in blk to put on my 5lb bar for smaller exercises. It works perfect. Very nice quality. When I opened th box I had no idea how nice they’d look, online pics don’t do it justice at all! There’s even metal in the center that gives it a real polished look. Rated 5 out of 5 by Jeramie from Great Bumpers I have limited height in my basement and can't go overhead with the barbell with normal size bumpers, so I got these and they work perfectly. They fit the barbell great and are really well balanced.